Since the introduction of Nature’s Aid skin gel, we have received countless letters and emails from people who have benefited from our unique formula’s healing properties. We would like to send a big THANK YOU to everyone who has written us, we truly appreciate your feedback and love to hear how Nature’s Aid has helped you. We will continually work to provide you with natural health and beauty products of the highest quality. Do you have a success story you’d like to share? We’d love to hear from you. My daughter’s friend has very bad acne and she has tried everything, including Proactive, so one night when she stayed over at our house, I got her to put a little bit on a spot on her face, she said it felt good, kind of a cooling feeling. In the morning, we were both amazed to see that spot was clear. A Success Story shared on NaturesAid.ca, March 2016. Nature’s Aid is great for everything! I use Nature’s Aid on my own sensitive skin as a head-to-toe moisturizer and, also after being out in the sun or the dry cold. My mother has used Nature’s Aid to help with post-surgery healing and my brother has used it to treat his infant daughter’s mild eczema. I’m looking forward to an occasion to treat my pets with it! I’m reassured by the fact that Nature’s Aid contains such clean and natural ingredients, unlike most commercial skin care products. Nature’s Aid is a miracle formula! While rushing around to get ready for a pool party, I tripped on the cement stairs, badly scraping and banging up my shins. 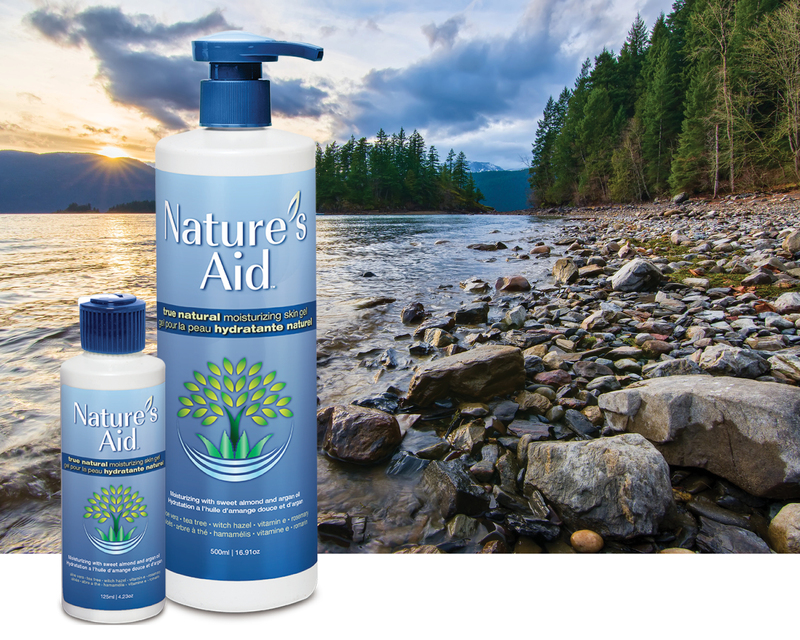 I immediately applied Nature’s Aid, which gave me great relief. After a while, the swelling was gone and the scrapes were barely noticeable. It was like magic!! I totally trust Nature’s Aid for any first aid treatment and recommend it to everyone. I also love to use the gel on face – it makes my skin feel so soft! Nature’s Aid has worked wonders for me. I had second degree sunburn on my head, face, arms and legs. Within 2 weeks of using Nature’s Aid, 2 times a day, the burns were healed. When the Doctors first saw my burns, they told me that I would probably be left with scars because of the severity of the burns. I’m very impressed because I don’t have any scars. I recommend Nature’s Aid to everyone. I’ve enclosed pictures for you to see. A friend visiting from Ontario had some and I used it on my arms that were sunburnt and really unsightly. It calmed the skin down immediately. Thank you. I’m sure you know how fabulous this Nature’s Aid is – just want to let you know how grateful I am to have been introduced to it. I’m constantly finding uses for it with great success and I really like that it is a natural product. I recommend Nature’s Aid skin gel to my patients and they find it soothing and enriching on their skin in addition to being therapeutic for burns and skin conditions. I use it myself on a daily basis and my massage therapist uses it in her practice. I recently had occasion to use the gel on my sunburn. I applied it 2-3 times over a 12-hour period and found it to be soothing, but, best of all, I did not blister or peel. This is a product I will continue to recommend to my patients. My husband has had a pre-cancer spot on his cheek removed surgically several times. We have been using Nature’s Aid since early this spring and the rough, red spot is barely visible now. It looks almost completely healed. He uses it very sparingly, but it does a wonderful job. Nature’s Aid advertises that it does many things and we have not found one that does not work! I’ve tried your product, and LOVE it! Would like to know who sells it in my area. Thank you!